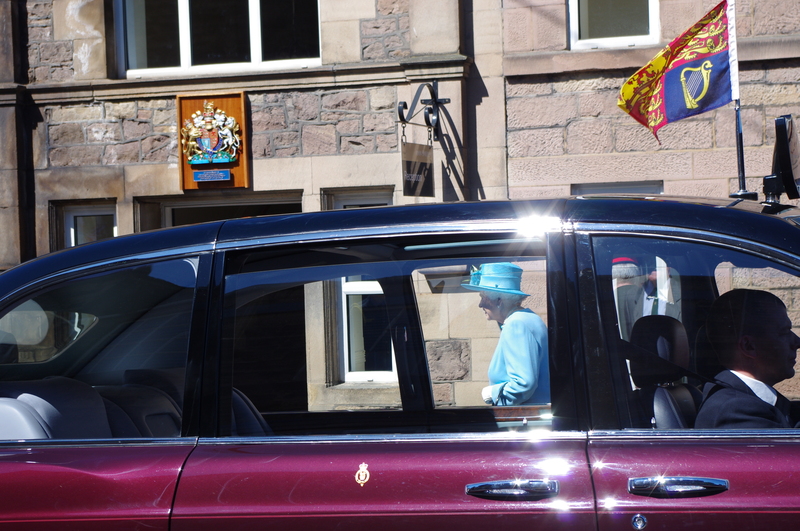 This morning I went to see the Queen. You’d be hard-pressed to find anyone who doesn’t like the Queen. I have never heard a single negative comment about her (unlike other members of the Royal Family), the only worry is what is going to happen when she’s no longer with us. Her mother, the Queen Mum, lived until she was 102, and everyone’s hoping that the current Queen will carry on the same way. At 88, she’s still doing between 300 and 400 official engagements a year. 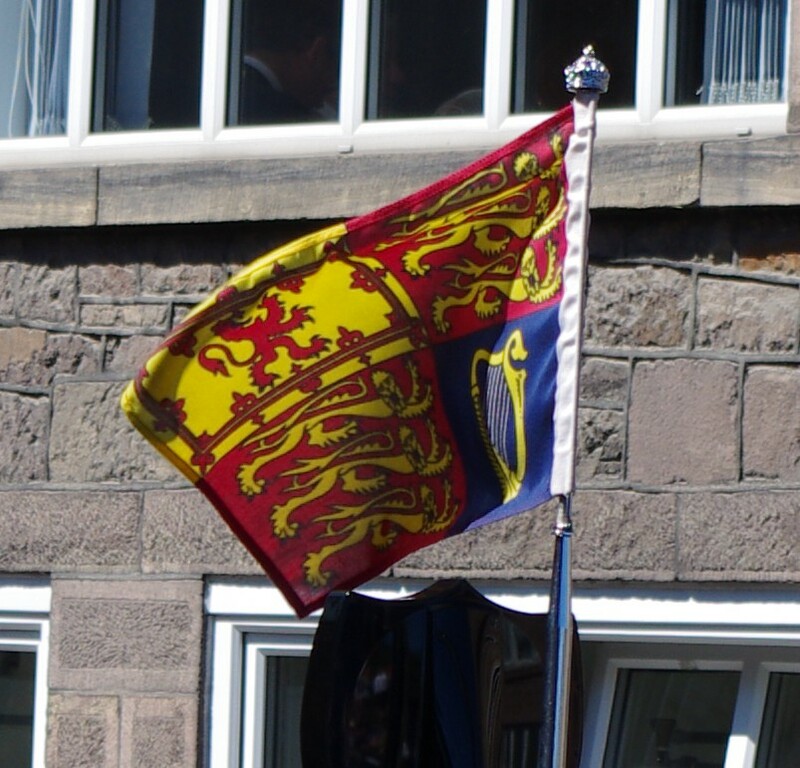 The Queen hasn’t visited this particular small region of England for twenty-two years, so it was time for a visit. And of course, it was done in grand style. She came in from Derby on the Royal Carriage, which was hitched behind several railway carriages on the Derby-Matlock line. After alighting in Matlock and receiving flowers and curtsies from small children and speaking with the crowd, she and her husband Prince Philip were driven the several miles to Lea Mills, where some of her clothing is made. 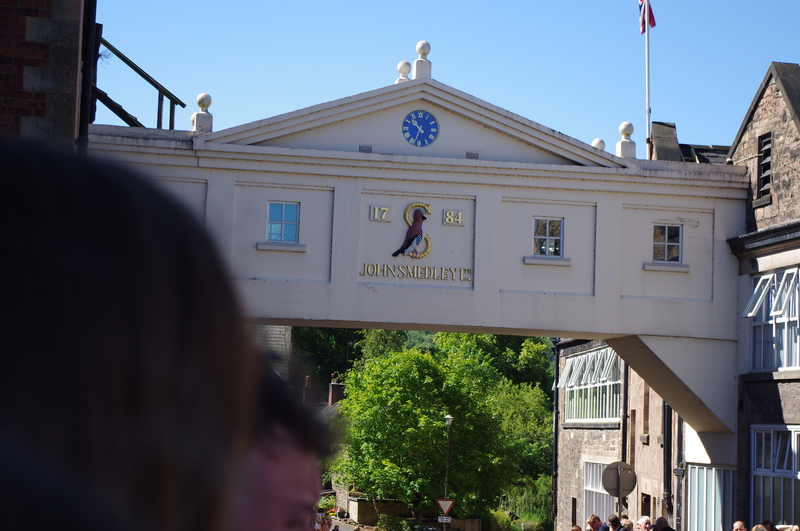 John Smedley’s mills, above, were built in 1784 during the Industrial Revolution. One of my great-uncles managed a factory floor here, and a great-aunt, a cousin, and two aunts worked on the factory floor or in the offices. 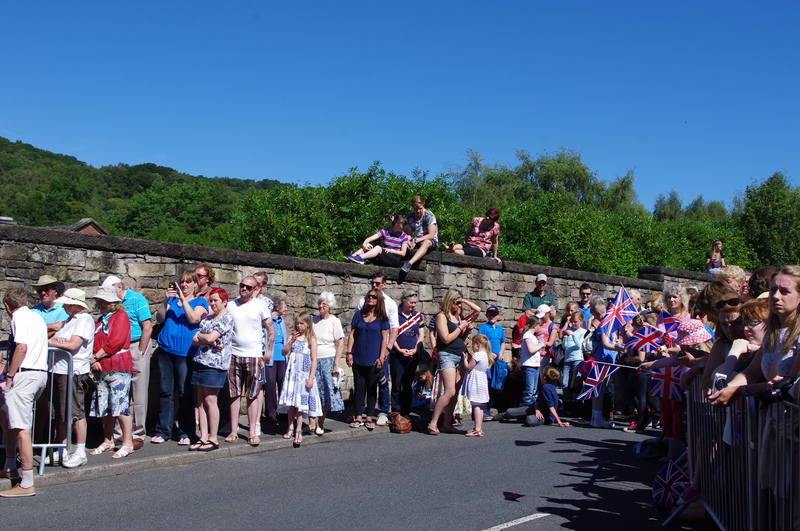 There was a huge crowd in the nearby town of Matlock, but here at Lea Mills, there was a much smaller, but still enthusiastic, crowd. 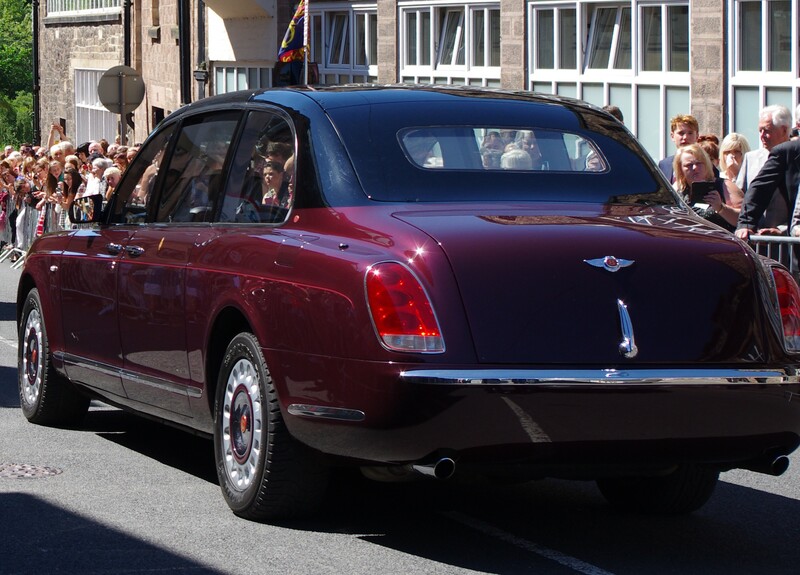 And here’s the queen arriving! It was surprisingly exciting to see her. 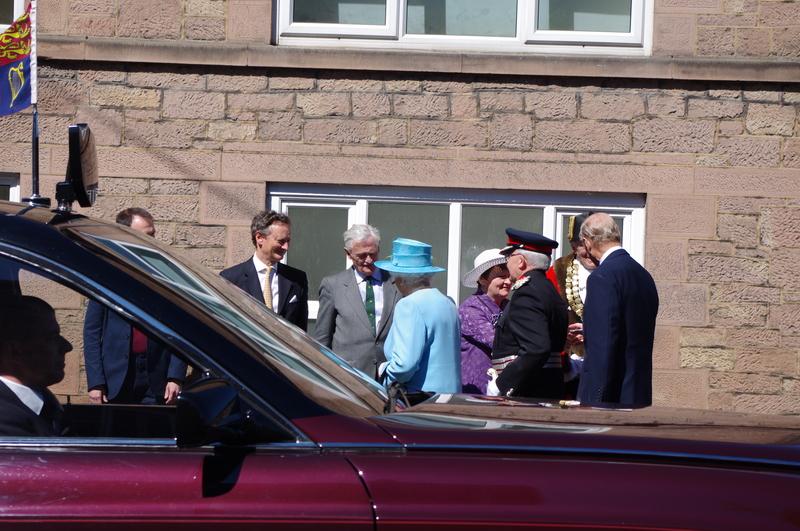 Below she and Prince Philip (right) are greeting the management of the factory and a local dignitary. 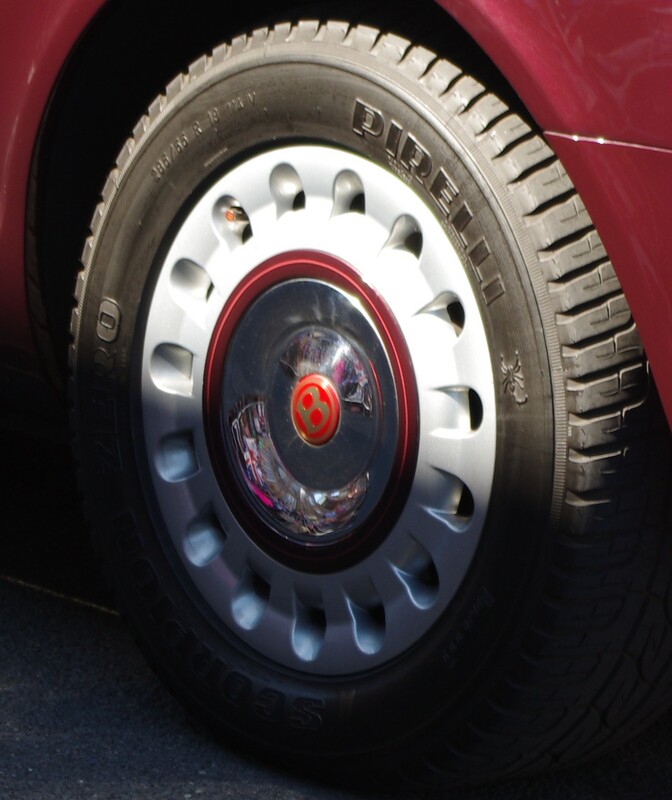 The royal hubcaps: The royal flag on the car: The Royal chauffeur. He and I are having a laugh together. 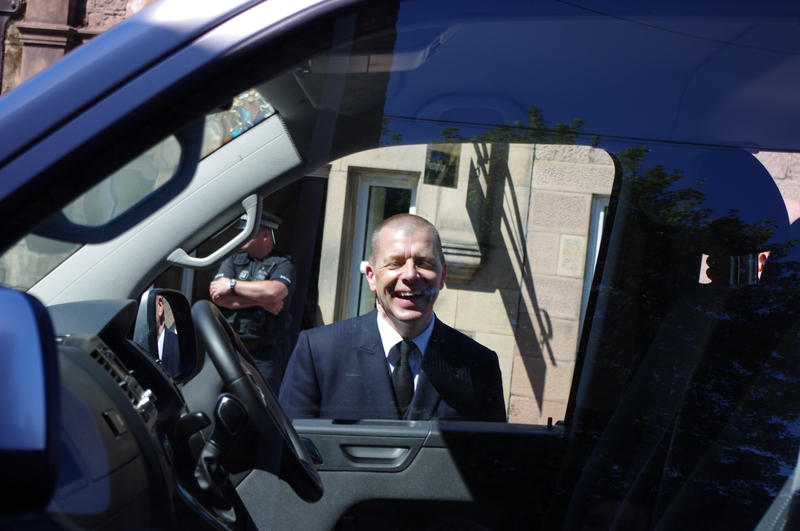 (Not really, but he had a lot of friendly interactions with the police and security men.) He has a very strong London accent, so I’m guessing he’s probably her regular driver. 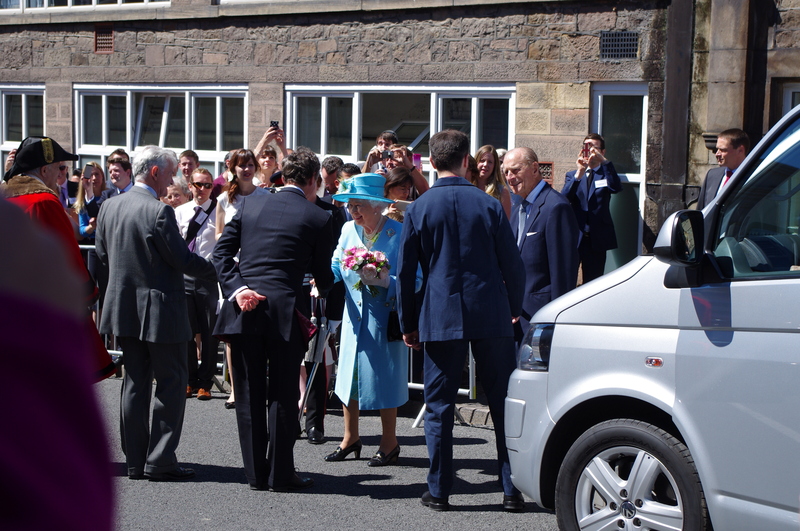 The Queen had a private tour of the mill and met its employees, and was regaled by a choir from the local primary school. Forty-five minutes after arriving, she emerged and was driven about ten miles north to Chatsworth House, owned by the Duke and Duchess of Devonshire, where she had lunch before getting in a helicopter to return to London. A long wait in the sun, but well worth it! As people here say, She’s a grand old lass. Long may she reign. Lovely to see everyone’s excited faces! Yes, it is, isn’t it! I thought I’d be relatively calm, but the excitement was infectious, and it is probably the only time I will ever see her, so I found myself shouting out with everyone else. In her quiet way, the Queen is really magnificent in all that she’s done for the UK.